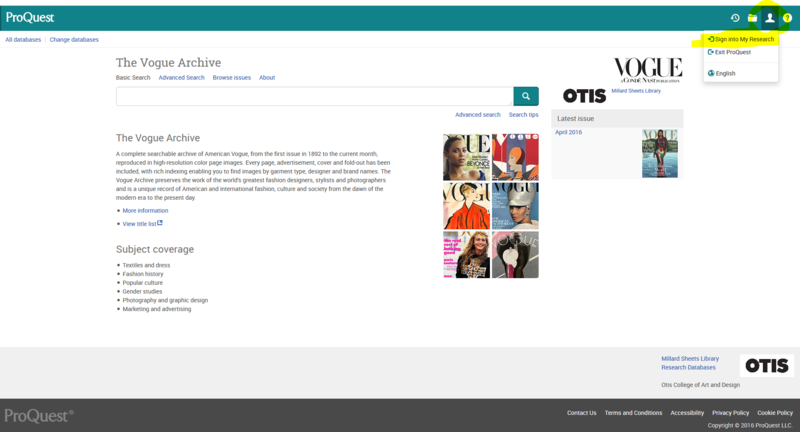 Like many other subscription databases, the ProQuest Research Library and the VOGUE Archive offer users an option to create a personal account to collect and save their research. It is called My Research. Once set up, you can save searches, documents, and preferences. More information is available from ProQuest. You will choose your own username and password. For security, do not use your Otis email password or PIN. 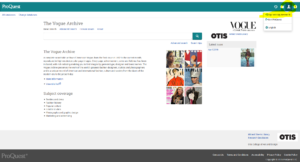 If you have already set up this optional personal account, please note that you must first access the databases from Otis (i.e., use the links above). This is a new security measure from ProQuest. As of June 15, 2016, it will no longer be possible to use your My Research account to log into ProQuest databases directly. You will not lose any of the links, documents, or preferences you have already set up. Please contact Heather Cleary if you have any questions.